Down in the basement of the VCU Cabell Library, students are immersing themselves into a whole new world of experiences–and it isn’t dusting off old books or leafing through archived letters for an academic assignment. 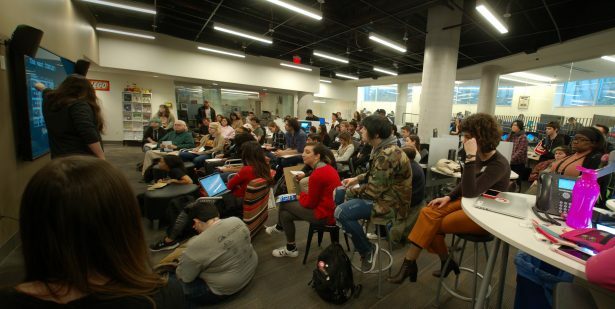 From learning to fly drones to stepping into the inner workings of virtual reality, to swapping zines, and creating animated flipbooks frame by frame, VCU students are mastering new crafts while having fun at the Wednesdays in the Workshop series. 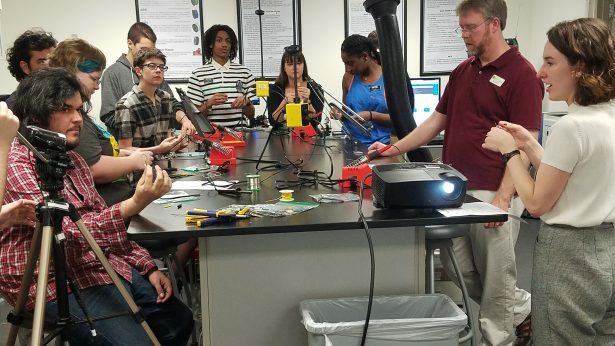 The thriving program, which was developed by The Innovative Media Center in the Fall of 2016, curates free weekly workshops with professors and other faculty, and sometimes even students to give participants hands-on demonstrations and instruction with something a little bit different and more exciting than the everyday curriculum. “This program is designed to expose the VCU community to different upcoming technologies and provide the necessary skills to learn and operate these new developments to be able to adopt this knowledge into a profession, hobby, or just everyday life,” said Eric Johnson, head of the Innovative Media Department. These informal, instructional, and educational workshops are open to not only VCU students, but the local community as well, and so far this semester, students have delved into everything from video game design, sewing, bookbinding techniques for zines, and 3D printmaking. On the schedule for the rest of March and April are workshops on leatherworking, podcasting, and making and mastering sounds in Ableton, a professional audio software used for music creation. “We recognized a desire for quick instructional sessions, where anyone could stop by and learn something new in an hour,” said Kelsey Sheaffer, Multimedia Production Specialist and a curator for the workshop series. This semester, the program had more than 80 people showing up to participant in the first event. The Zine Show and Swap Workshop, held back in February, was a popular one, not surprisingly considering Richmond’s long and vast history with the DIY zine-making scene. VCU students get access to free equipment from DSLR camera rentals to microphones, cables, lights and more. Students are able to use equipment for any sort of project they desire, it can be both academic or for creative endeavors of their own. Sheaffer said the DSLR camera rentals are by far their most popular item. “We get rental requests from students about every 30 minutes. We love when people come and use our equipment for non-academic reasons, we strive to act as a catalyst toward the procurement of young entrepreneurial spirits and help them learn because the majority of learning happens outside of the classroom,” she said. 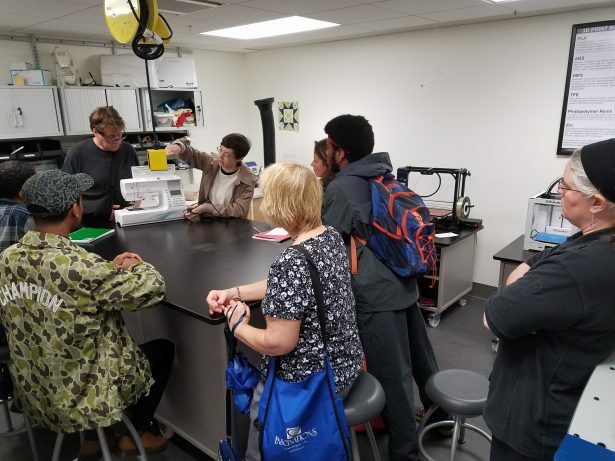 The Innovative Media Center also has access to many different “makerspaces” like 3-D printers, laser cutters, embroidery machines, audio and video studios, and gaming studios. I decided to try my hand at renting some equipment for a little documentary I am working on. I left with a tripod, an external microphone, and a GoPro hero 4 with all the extra attachments in just minutes. The Innovative Media Center, which opened is 2015, is used for non-academic reasons as much as for classes and projects. “We have a ton of people coming in from the Da Vinci Center working in our maker space. Tons of student projects are being created that are both hobby and scholarly. We get a wide array of students from the business, engineering, and art school,” said Johnson. These two have a lot in store for the future of Wednesdays in the Workshop as well as the Innovative Media Center as a whole. They are looking to incorporate the greater Richmond area in their expansion and immerse the community in their journey to instructional technological education. “I would love to bring in more community members and make it a bigger and more independent thing,” Sheaffer said, mentioning the center is thinking of bringing representatives from businesses like The Martin Agency for an animation workshop or kinetic imaging. Johnson added they would also like to add a speaker series and skill-based workshops. “Mostly we just need more space to satisfy the growth of the program like a classroom as well as computers with the same software in order to reach a larger group of people at once,” he said. But for now, Sheaffer and Johnson are eager for feedback from students and the community and to start delving into even more hands-on experiences for people who participate in these weekly workshops. Wednesdays in the Workshop takes place every week from 3 to 4 PM inside the Cabell Library for the rest of the spring semester. Check out the full rundown of workshops here. We made it down to SXSW this year to cover our favorite RVA bands (more on that tomorrow) and see what else was going on.